Highest pollen count ever – there is no cure – wrong! I watched BBC Breakfast this morning with great interest and lots of frustration. It featured a small boy playing football in his garden with his mum – both of whom suffer with hay fever. The mother was interviewed back inside her home and showed how she was using an inhaler and anti-histamine to prevent coughing. She also had very red, inflamed and itching arms after ‘just being in her garden’. At the end of the article the report exclaimed emphatically – “there is no cure for hay fever”. “That’s so wrong” I cried. It’s so wrong on two counts. One it’s wrong because no one needs to suffer with hay fever so my exclamation came from a knowledge that I can help those sufferers and two, because there is a ‘cure’. My frustration is that I know not everyone will take what I say on board and come to see me to get it sorted out. I spoke to two people on Saturday – both suffering badly – but neither sounded like they would actually call me, they were both going to take another anti-histamine in the hope it would stop the agony. I absolutely respect their choice and I know what I do seems strange to some people. What I don’t understand is if they are suffering that much why wouldn’t they give it a try. I offer a 60 day money back guarantee on products -no quibble! Try taking your empty packet of anti-histamine back to the chemist and asking for a refund. Why is the pollen count so high? Most people are aware by now that we have had the coldest Spring in many, many years and the result of that is that rather than a staged pollen release of trees, grass and then weeds and flowers which happens naturally – the sudden burst of warm weather after such a cold Spring meant that everything released it’s pollen at the same time! There was so much pollen in the air that hay fever sufferers found that they had to take more medication or that the medication just wasn’t working any more. 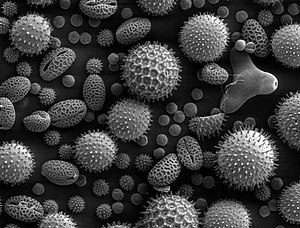 Pollen is released when the temperature gets to around 15 degrees but really gets going at 17 degrees. The pollen levels usually affect people early in the morning and late in the day because in the middle of the day the warm air currents keep the pollen ‘above nose level’ . When it is really windy those air currents distribute the pollen at lower levels. Whilst taking Bee Pollen is not a ‘cure’, in that it will not stop you being susceptible to hay fever when you don’t take it – it will stop it if you take it when you do. But you could say that about any medication couldn’t you? So the use of the word ‘cure’ is interesting. What is a ‘cure’ exactly? Based on this definition, I’d say you could describe a solution to hay fever as a cure couldn’t you? Whether to take anti-histamine or steroids is, of course, a personal choice. Having been a hay fever sufferer (allergies and eczema very often go together), my personal choice was not to. Histamine is the chemical which your body releases to try to combat the exposure to the allergen – it is your immune system responding to protect you – so logically why would I want to supress that if there was another way? It is the histamine which causes the itching, sneezing and inflammation. Anti-histamine does stop the symptom, it supresses the immune response. However, over time, people find they need to take more and more anti-histamine as the body tries to fight back to restore the immune system. Another way of balancing the immune system is by drinking aloe vera juice. It restores the immune system to normal levels and is very effective in reducing inflammation in all areas of the body and so can be very helpful with hay fever. You can find out more about aloe vera here. The therapy of Kinesiology uses a strategy which is to strengthen the immune system and to de-sensitise the body’s energy system to the allergen so that the histamine isn’t released. When the body no longer perceives the allergen as a threat, it doesn’t release the histamine. All you have to do is find the allergen. That sounds difficult? – it really isn’t if you know how – and yes, you guessed it, I know how. If you don’t know exactly what you are allergic to, it’s not a problem. I have over 500 potential allergens in my test kit – and if your allergen isn’t in there, we have other ways of finding it. In 99.9% of cases, the process only has to be done once. You can find the pollen count in your area with a really helpful page on the Met Office website, it’s sponsored by Benadryl (a product I don’t support) but it has really good information. If you would like to have a chat about how I can help you so that you don’t have to keep your fingers crossed for a sneeze free Summer then please contact me. May be there is a ‘cure’ for you after all? I’ve met many people over the last couple of weeks who have a stubborn, irritating cough, sometimes left over from a cold or flu virus. Mix together. I use a small screw top jar and shake it. Take 2 tsp when needed. I find it best to take the second dose quite quickly after the first and then take as needed. It’s not for the faint hearted but it really does work.